Our highly successful MACE-Seq service is now also available as a kit. It contains all ingredients to perform MACE-Seq. In contrast to other “3’mRNA Seq” or “Tag-Seq” approaches the MACE-Seq Kit includes our patented TrueQuant method (molecular barcodes) to avoid PCR-bias, for the generation of qualitative and quantitative accurate data on any Illumina sequencing machine. MACE-Seq allows for accurate and cost efficient high-resolution gene expression profiling, genotyping in transcripts, allele frequency determination and the analysis of alternative polyadenylation. Up to 96 samples can be processed in parallel. The MACE kit comes with bioinformatics-vouchers for a convenient analysis of the data on our servers. As MACE data have some specificities, we have developed an optimized analysis pipeline that you can access using the vouchers. Simply upload your data using the provided voucher-codes to our servers. We provide complete result tables compatible with Excel, as well as plots of your data and Gene Ontology enrichment analyses. The raw and the refined data is accessible via our easily understandable web interface at http://tools.genxpro.net. Therefore you do not need bioinformatians nor special hardware for the detailed analysis of the complex data. 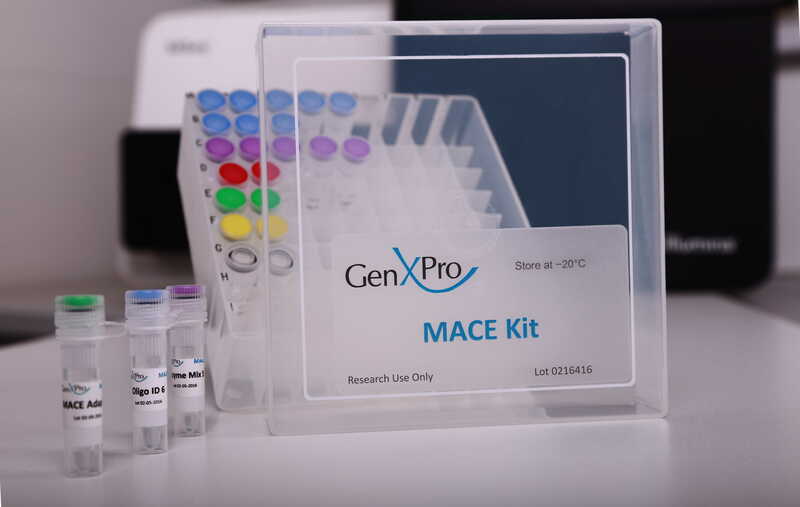 The kit is available as 6x MACE version for up to 6 MACE libraries on the Illumina MiSeq platform and a 24x version for the Illumina HiSeq or NextSeq. With further indices, several kits can also be combined for example to reach 4×24 samples. 1Pooling strategy: One advantage of the MACE kit is that the samples are pooled after generating barcoded cDNAs. The 6x and 24x kits are designed to pool up to 6 and 24 libraries, respectively. The kit contains reactions to generate up to 6 or 24 libraries in the pre-pooling step and one post-pool reaction in the 6x kit and two post pool reactions in the 24x kit. For additional pools (e.g. 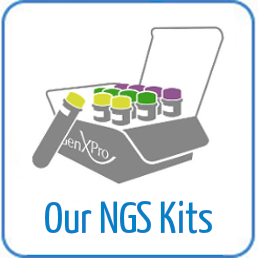 for only two samples), additional post-pooling reagents can be purchased separately (cat.no. 16040.1 and 16040.2). Customers in Japan: please contact FUNAKOSHI. We also offer MACE-Seq as a service including optional RNA extraction and bioinformatics. Tosches MA, Yamawaki TM, Naumann RK, Jacobi AA, Tushev G, Laurent G. Evolution of pallium, hippocampus, and cortical cell types revealed by single-cell transcriptomics in reptiles. Science. 2018 May 25;360(6391):881-888. Agarwal R, Cao Y, Hoffmeier K, Krezdorn N, Jost L, Meisel AR, Jüngling R, Dituri F, Mancarella S, Rotter B, Winter P, Giannelli G.Precision medicine for hepatocelluar carcinoma using molecular pattern diagnostics: results from a preclinical pilot study. Cell Death Dis. 2017 Jun 8;8(6):e2867. Schuberth M, Levin J, Danek A, Rotter B, Heine GH, Ziegler-Heitbrock L. slan-defined subsets of CD16-positive monocytes:Characterization of subsets of the CD16-positive monocytes: impact of granulomatous inflammation and M-CSF-receptor mutation. Blood. 2015 Oct 6. pii: blood-2015-06-651331. The MACE-kit is for research use only.